Is Vanished Son Adrift In Space? ‘I have gone away to walk aboard an alien space ship . . . Dreams assured a . . . voyage to explore the vast universe. Is vanished son adrift in space ? Granger built this spaceship from two satellite dishes and even slept in it on occasion. 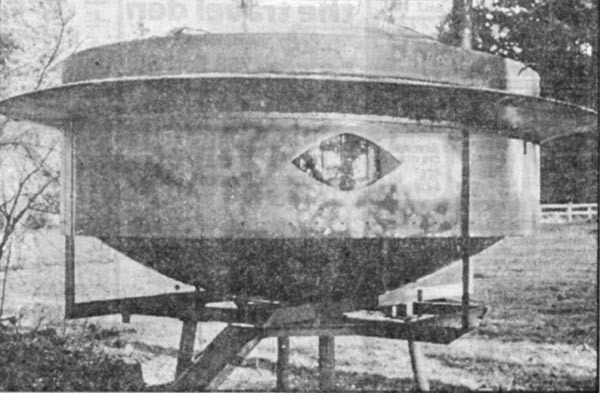 The silver spaceship sits on metal pillars under the trees at Jim and Grace Taylor’s farm near Duncan. Its aluminum-plate ramp door is ajar and broken — the Taylors suspect from children playing — but inside, the large old sofa, pot-bellied stove, and plywood sleeping ledge are much the way their son, Granger, left them. All around the verdant property that sweeps down to the marshes of Somenos Lake, there are collections of old equipment — steam pots from donkey engines, old tractors, an ancient bulldozer, railroad artifacts of a bygone era — that their son culled lovingly from Cowichan Valley bushes. They are much the way Granger left them, too. The Taylors have tried to keep everything the same. His bed in his bedroom next to the kitchen is untouched. The plaques he saved from engines he’d repaired — triumphs and trophies of his mechanical aptitude — hang on a cupboard door. 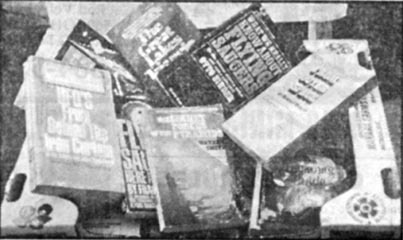 His books are there, too, paperbacks, mostly, with titles like Black Holes, The Secret Forces of the Pyramid, Flying Saucers Here and Now, and From Outer Space, stored now in a cardboard box. The Taylors desperately want to believe their son will come back. But after 51 months, it is tough to keep up hope. Granger has simply vanished. Almost as if he was plucked off the face of the world. If you can take Granger’s word for it, that is what happened. Before leaving, he tacked a note to his father’s bedroom door. His father found it when he came home from work the afternoon of Nov. 29, 1980. “Dear Mother and Father,” it said. “I have gone away to walk aboard an alien spaceship, as re-occurring dreams assured a 42-month interstellar voyage to explore the vast universe, then return." “I am leaving behind all my possessions to you as I will no longer require the use of any. Please use the instructions in my will as a guide to help. On the other side of the note was a contour map of Mount Waterloo, west of Duncan near Skutz Falls. If the map has any hidden meaning, no one knows what it is. The 42 months were up last May 29. The Taylors left the back door unlocked that night just in case he showed up. But he never did. Demchuk described as “exhaustive checks” nothing has turned up, not a single clue to his whereabouts. The Taylors, realizing how crucial the recovery of the vehicle is to solving the riddle of their son, periodically take out newspaper ads offering a $100 reward for anyone finding it. With so little to go on, the investigation has centered on standard checks - passport office, Revenue Canada, Unemployment Insurance. Granger’s name has been put on the national police computer system. And the motor vehicle branch in Victoria has been alerted in case Granger’s driver’s licence, which expires this October, is renewed. The last anyone recalled seeing Granger was early Saturday evening, Nov. 29, 1980, when he stopped in at Bob’s Grill in Duncan for supper. He was a regular at the roadside diner. Linda Baron was working in the kitchen. She saw him enter and take a table by himself. She couldn’t recall any conversation, but Granger was the quiet type anyway. She remembered he wore a brown knitted sweater zipped up front, a black T-shirt (he was never without), jeans and logger boots. He didn’t have his winter coat. Strangely, Taylor discovered the coat a couple of days later inside the sturdy doghouse that Granger built for his huge Newfoundland dog, Lady. Granger left around 6:30 p.m.
That night a storm struck the central part of the Island. Hurricane winds were reported in Port Alberni. Power was knocked out in several locations, including Duncan. Granger would have been hard to miss in any crowd. Built like a bull, he weighed 120 kilos and was as fit as a wrestler. Indeed, he was a wrestling buff and even had his own ring on the farm. 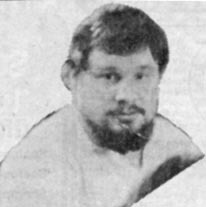 According to Taylor, the well-known Canadian wrestler Gene Kinisky once paid a visit. Ben. But what really set him apart was his exceptional ability to fix anything mechanical. “I guess you could call him an eccentric genius,” long-time friend Bob Nielsen said. Even Granger’s teenage accomplishments were impressive. At 14 he made himself a one-cylinder car. It’s now in the Duncan Forest Museum directly across the lake from the Taylor farm. At 17 he overhauled a bulldozer that no one else had been able to repair. He restored an old steam locomotive that he hauled from the bush. It’s in the museum, too. He even built an airplane, a replica of a Kitty Hawk warplane that for a couple of years was mounted outside a store on the Island Highway just south of Duncan. A Manitoba restorer of vintage aircraft bought it in 1981 for $20,000. The Taylors put the money in Granger’s bank account and there it waits, collecting interest. The balance now totals around $30,000, including other savings he had on hand. A Grade 8 drop-out, Granger got his first job with a neighbor as a mechanic’s helper. After a year or so, he quit to go on his own. He never worked for anyone else. At one point he got his pilot’s licence and bought a plane with a partner. In the late ‘70s Granger, a keen believer in UFOs, built a spaceship out of two large satellite receiving dishes which he welded together. His father said it took him six or seven months to complete the project. He spent hours sitting in the contraption. He slept in it on occasion, too. Granger was obsessed with finding out how spaceships were powered. All of his friends knew of his interest. It was one subject about which Granger was never reticent about talking. A month before he disappeared he told Nielsen he had had contact with some other being. A few days later Granger mentioned he’d been invited to go on a trip through the solar system. He would know at the end of the month where and when he’d be picked up. Granger was thrilled, Nielsen said. A week before he left he took several of his friends out on the town. It was sort of a going-away party. “Everyone thought the trip was just a dream,” said Nielsen. They humored him. But nobody entirely discounted Granger’s stories. “He was such an unusual sort of guy,” Nielsen said. 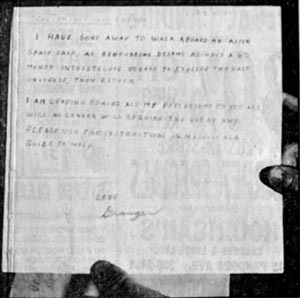 Granger didn’t reveal details of the rendezvous to anybody. The night before he left he went into his father’s bedroom and had a long talk with him about how grateful he was for all Taylor had done for him. Granger was a stepson but that distinction had never mattered in the past. His mother was in Hawaii, her first holiday in years. She’s never completely forgiven herself for being away at this critical time. There are those who believe Granger went on his space trip. John Magor of Duncan is one. He’s a UFO devotee who once edited his own quarterly magazine on the subject. There have been reported cases of aliens taking humans on rides in saucers in other parts of the world; why not here, then? he mused. Dr. Max Edwards, a linguist and former professor at the University of Victoria, is another believer. He’s devoted years of scholarly research to the phenomenon. The Island is not on the favored route taken by saucers that girdle the globe, he said. Sightings here are relatively rare but that doesn’t mean they don’t occur, nor does it mean that Granger wasn’t telling the truth. The simple truth is no one knows the answer. “I can hardly believe Granger’s off in a spaceship,” his father said. 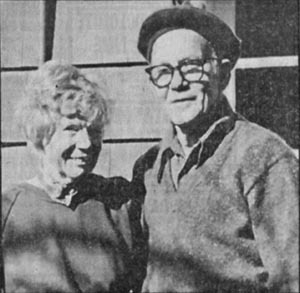 Jim and Grace Taylor wait and hope for son's return. Letter to parents adds to puzzle of what was on Granger's mind.